Before you leave home, slip the ultra-slim COOLPIX S9600 into a pocket or purse, and you'll be able to capture and instantly share amazing close-ups on the go. Its powerful 22x optical zoom NIKKOR glass lens brings distant subjects within reach, and lens-shift Vibration Reduction helps prevent a little camera shake from making shots blurry. Use a compatible smartphone or tablet to instantly share your photos by text message, email or uploading to your favorite sites and even remotely control the COOLPIX S9600—see what the camera sees and take photos! And of course, Nikon technology makes taking great photos and Full HD 1080p videos a breeze, even in low light situations. Every COOLPIX is designed around a genuine NIKKOR glass lens, the legendary optics that have made Nikon famous. 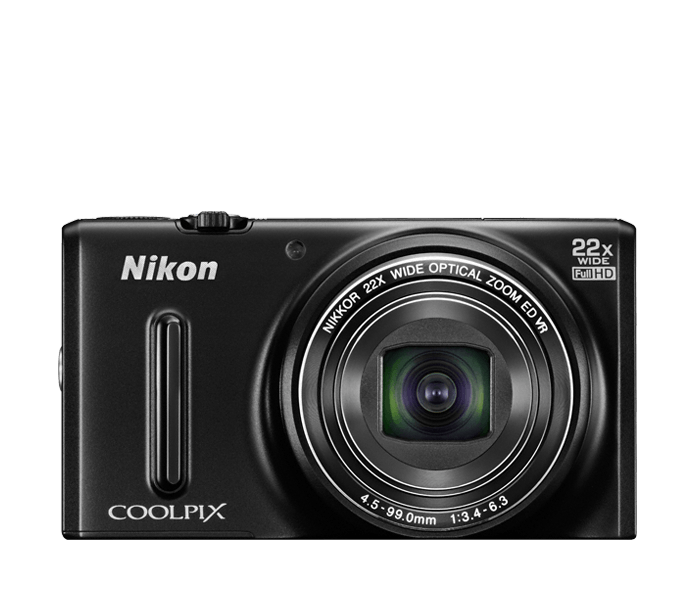 The COOXPIX S9600 features a 22x Zoom NIKKOR lens that takes you from wide-angle group shots to telephoto close-ups in an instant. And don't worry about a little camera shake—Lens-shift Vibration Reduction keeps the shot steadier even when your hands are not. Your smartphone or tablet will be your favourite accessory! Take beautiful photos with the COOXPIX S9600 and watch them instantly appear on your compatible smartphone or tablet. Then share them without missing a beat—text them, email them, upload to your favourite social networking site—it’s your choice! You can even use your smartphone or tablet as a remote control for the COOXPIX S9600, perfect for self portraits and group shots that actually include you. If you want a compact camera that shoots stunning Full HD videos, the COOXPIX S9600 delivers. Full HD 1080p means exceptional video quality. Record the action, then connect to an HDTV* and watch your videos come alive. A built-in mic records high-quality audio in stereo. Your videos will look and sound phenomenal. It's frustrating when a smartphone camera focuses on the wrong thing. With COOXPIX S9600, Target Finding AF instantly and accurately determines your intended subject and focuses on it—not on just whatever is closest to the camera. Catch the shot you want on the first try. No more out of focus shots or the frustration of trying to get the camera to focus on the right thing. Imagine being able to shoot without a flash at weddings, concerts, parties—anywhere your flash normally fires. You won't have to interrupt a moment to capture it, and your photos will look more natural and true to your memory. The COOXPIX S9600 performs so well in low light situations that, in most cases, using the flash is optional. Of course, when the lighting is extremely poor and you need a flash, it'll be there. Kids and pets are always on the go. Fortunately, the COOXPIX S9600 includes Subject Tracking, which automatically locks onto a moving subject and helps keep it in focus until you're ready to take the shot.